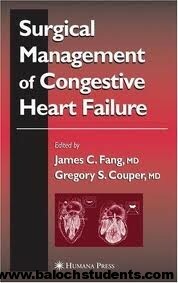 James C. Fang, MD, and Gregory S. Couper, MD, have assembled a panel of prominent surgeons and cardiologists to review the latest clinical, scientific, and investigational surgical and mechanical approaches to heart failure in hopes of improving the lives of this challenging group of patients. Topics range from such traditional strategies as high-risk surgical revascularization in advanced coronary artery disease, to more novel approaches such as ventricular reconstruction and mechanical assist devices. Many chapters are contributed by the original pioneers of specific surgical techniques, which provide s invaluable perspective from personal experience. * Average Customer Review: No customer reviews yet. Be the first.